Never Let Me Go, by second-time director Mark Romanek, is one of the films hailed by the critics who have seen it before its official release and it's set out as a possible Academy Award contender. The rumors seem to be true, at least in my case. 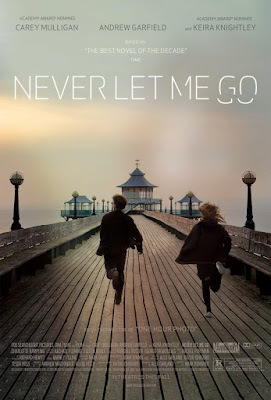 A major improvement over the interesting but incomplete One Hour Photo, Never Let Me Go is a very peculiar movie hybrid, combining romantic drama sensibilities with a hint of science fiction, yet so elegantly placed that the viewer will hardly notice it's there. As the book that preceded the film, it tells the story of two young girls and a boy, growing into adulthood in the confines of a boarding school which is essentially a clone breeding facility. When the clones reach a certain age, they become organ donors, a process which is not instantaneous, but might actually last a long time with several operations. Restricted although the children are, Kathy (Carey Mulligan) falls in love with Tommy (Andrew Garfield), although Ruth (Keira Knightley) is determined to win him over.